No. 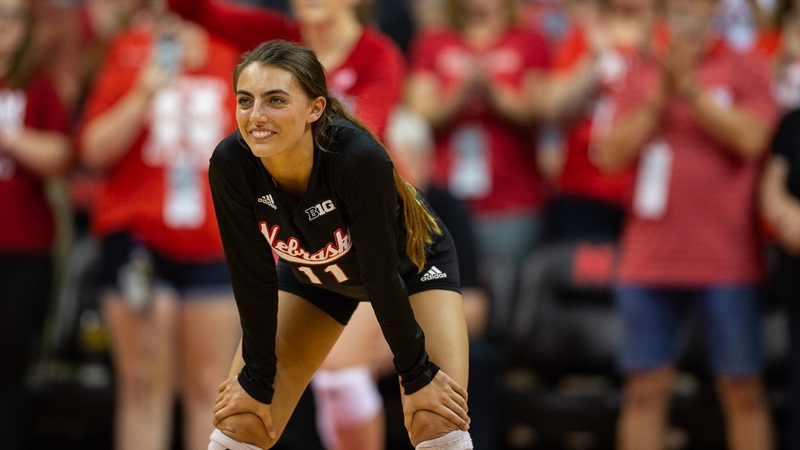 5 Nebraska (3-1) never trailed in a 25-14, 25-11, 25-9 sweep over Wake Forest (0-5) that improved the Huskers to 2-0 in the Ameritas Players Challenge at the Devaney center on Friday. Nebraska overpowered the Demon Deacons at the net all night, out-blocking them eight to one and out-hitting them .341 to -.033. Nebraska committed a season-low eight attack errors and served up as many aces as errors (eight of each). After committing four attack errors in the first match on Friday, sophomore opposite hitter Jazz Sweet bounced back to lead all players with 11 kills on 19 swings, and she didn’t record a single miscue. Sophomore middle blocker Lauren Stivrins put together another strong showing with eight kills on 10 attempts. Hames, the freshman setter, totaled 26 assists and 11 digs for the second double-double of her young career. Senior libero Kenzie Maloney posted a match-high 12 digs, her third straight game leading all players in that statistic. Wake Forest hung around for the first handful of rallies until a 10-2 run by the Huskers including a 6-0 stretch with Hames serving gave Nebraska plenty of separation. Nebraska cruised to an 11-point win which proved to be the smallest final margin of the night. Wake Forest burned both of its timeouts in the first 19 rallies of the second set as runs of 3-0, 5-0 and 4-0 gave the Huskers a double-digit lead at 16-5 and Nebraska continued to stretch out its lead until the frame came to a close. Nebraska out-hit Wake Forest .522 to -.100 in the second set. The third set was more of the same as the Huskers took control with a 5-0 start and never gave the Demon Deacons a sliver of hope. Leading 21-8, Cook sent freshman defensive specialist Chen Abramovich into the match to make her Husker debut. Junior setter Mari Kurkova and sophomore opposite hitter/middle blocker Anezka Szabo also played in the third set after making their season debuts against Ohio earlier in the day. Sun, the sophomore outside hitter transfer from Texas, did suit up and participate in warm-ups for the first time this season but she did not enter the match. The Huskers closed out the match with a 4-1 run to complete the Friday sweep. The Huskers will return to the Devaney Center on Sunday for a showdown against Santa Clara (4-2) to determine the tournament champion. The Broncos swept Ohio 29-27, 25-18, 25-20 on Friday evening after beating Wake Forest in four sets in the morning. First serve is set for 2 p.m.